Now THAT was a blindside! Survivor has a way of delivering jaw-dropping and shocking eliminations when it comes time to voting off their castaways. And Survivor: Cambodia – Second Chance just offered the best one yet this season! Nobody on the bottom half of the tribe expected this week’s results. At first it seemed like an easy week, but as the game has shown in the past, anything can happen after a bad challenge or even a comment. Someone got a lucky break! 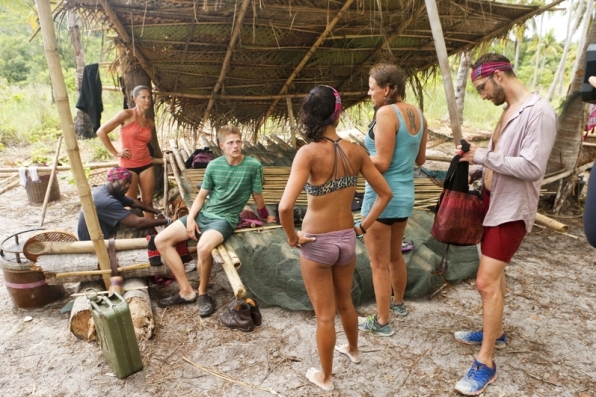 After the depressing events of Angkor’s losses the last two weeks, it was almost expected they would be seeing a Tribal Council again pretty soon. They were already starting in low spirits after voting out Jeff the round before and nothing could help them out. But something miraculous happened: Their luck turned around. The group found unity and trust within each other to push forward during the challenges and try to win. Angkor not only won the reward item for the week, but they won immunity too! For the first time in two rounds, Angkor could breathe a sigh of relief and enjoy a night in. Bayon or Ta Keo would be the Survivor tribe heading to Tribal Council. The two tribes dominated the last two weeks; each enjoyed the luxuries of their previous camps and the comfort to recharge between challenges. Now the predicament is on the other foot–one of these two tribes would be voting someone out. It’s a classic case of the balance of power. It only takes one challenge win to change the game for the rest of the season. Could this be that moment? Unfortunately for Bayon, this was not their week. The once dominating pink tribe lost back-to-back Survivor challenges. They didn’t get the reward, and for the first time for a few of the castaways, this would be their first trip to Tribal Council. Many of them would need to start figuring out which player would be the one to go. Spencer and Kelly Wigglesworth became the obvious choices. Both were originally from a different tribe before the tribe swap and now they were in a minority situation against four original members from the same tribe. This situation has occurred in past seasons of Survivor. Sometimes the majority alliance would pick off the remaining weaker players one-by-one until the merge would occur later on in the season. However, in a few rare cases, the majority would take the opportunity to turn against one of their own and vote them out. It’s a powerful move and a devastating blindside for the betrayed alliance member who didn’t expect the stab in the back. Kelly Wigglesworth was a dead woman walking. The alliance was ready to vote her out and keep the original group together. However, a quick conversation between two alliance members began to turn the tide. Monica wanted to make a girls’ alliance and vote out Spencer instead–she brought the idea up to Kimmie. Kimmie doesn’t like Monica nor trusts her! She can see Monica’s shady side and knows if the time were ever to come, Monica would backstab her. Kimmie informed the news to the men in her alliance and they had a quick chat to brainstorm their options. Kimmie turned the tide and blindsided Monica. She had no idea the vote had turned against her; the shock was clearly all over her face! In her original season of Survivor: Australia, Kimmie played a safe and personable game, making connections with her tribe or getting into fights. It’s the old style of Survivor gameplay, but she quickly caught on this season and made a plan of attack. Monica didn’t know what hit her! Kimmie masterminded a jaw-dropping (and incredible!) game move that will earn her some way in the finals. The smallest moment can send ripples throughout the season. Now that the Bayon tribe has turned against one of their own, will it come back to hurt them in the end? Monica wanted a girls’ alliance, but it’s hard to say if it would have benefited anyone else. A merge is coming up pretty soon and the numbers will mean everything, especially when blindsides are more prevalent closer to the grand prize. Previous ArticleMovie Review: "Jem and the Holograms"